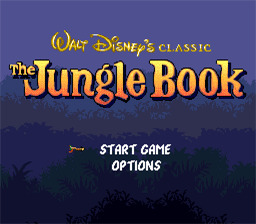 This game is based on Walt Disney's animated film The Jungle Book, which is based on several of Rudyard Kipling's stories. Follow the adventures of Mowgli, a human child found on a riverbank by Bagheera the Panther, and then raised by a family of wolves. Now the story makes its way on to the SNES. Help Mowgli find his way to the man-village while avoiding trouble from King Louie the Ape, Kaa the Python, and Shere Khan the Tiger.